Bead, antique brass-finished "pewter" (zinc-based alloy), 5x4mm studded oval. Sold per pkg of 24. Item Number: H20-7505MB Have a question about this item? Super for vintage-look jewelry, add Swarovski® crystals for glistening treasures. Bead, antique brass-finished "pewter" (zinc-based alloy), 5x4mm beaded rondelle. Sold per pkg of 24. 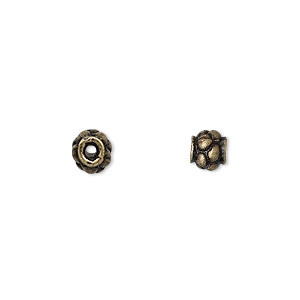 Bead, antique brass-finished "pewter" (zinc-based alloy), 4x2mm rondelle with dots. Sold per pkg of 24. 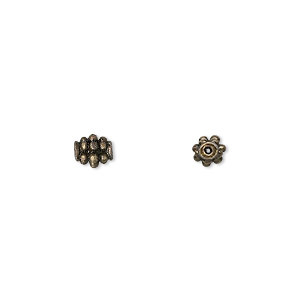 Bead, antique brass-finished "pewter" (zinc-based alloy), 8mm fluted round. Sold per pkg of 24. Bead, antique brass-finished "pewter" (zinc-based alloy), 6mm beaded round. Sold per pkg of 24. 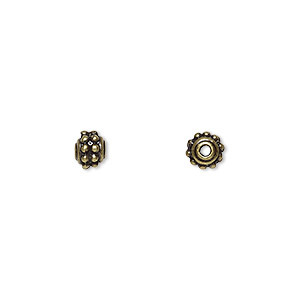 Bead, antique brass-finished "pewter" (zinc-based alloy), 9x2mm rondelle with dots, 2mm hole. Sold per pkg of 24. Bead, antique brass-finished "pewter" (zinc-based alloy), 9x5mm flower rondelle with dots, 2mm hole. Sold per pkg of 24. Bead, antique brass-finished "pewter" (zinc-based alloy), 5mm fancy round. Sold per pkg of 24. Bead, antique brass-finished "pewter" (zinc-based alloy), 7x3mm double dot rondelle. Sold per pkg of 24. 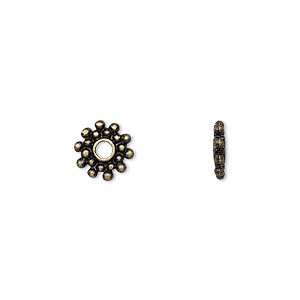 Bead, antique brass-finished "pewter" (zinc-based alloy), 6x2mm rondelle with dots. Sold per pkg of 24. 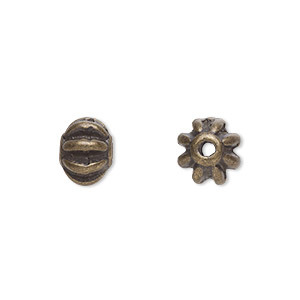 Bead, antique brass-finished "pewter" (zinc-based alloy), 6x4mm wheel rondelle. Sold per pkg of 24.